Valerio Olgiati - landscape living. Our home is far away from the next town. It is disconnected in every respect. There is only the vast empty landscape around us. In Villa Além, a sense of loneliness and independence arises. 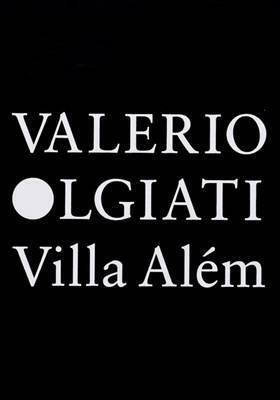 Valerio Olgiati, Villa Além, Name Books, 2015. For many years, my wife Tamara and I had been searching for a place for which we could leave our current home in the Swiss mountains on social, cultural and climatic grounds. In the Alentejo region in Portugal, we found the perfect situation. A wonderful climate, a wide empty landscape and an existing culture that we like. Here, we spend a couple of months a year. From here, we work – my wife is also an architect – close to our office in Flims. The basic idea and the all-influencing aim of our project was to create a garden, even more than a shelter, which, of course, we also have. The form of our house indeed should not primarily express ‘shelter’. It is the ‘garden’ that has to essentially find its form and that we want to experience. To date, three main forms are known to me in terms of housing. The first, ‘urban living’, I understand as living in the dense fabric of an urban setting. Then, ‘suburban living’, which takes place in a typical one-family home with a small garden in suburbia, and finally, ‘country living’, where people live socially and infrastructurally connected at large rural intervals. We excluded all three of these forms for our house. This was not what we were looking for. Our home is far away from the next town. It is disconnected in every respect. There is only the vast empty landscape around us. In Villa Além, a sense of loneliness and independence arises. The climate is mild and dry. The primary intention here is to create a secluded garden. The surrounding walls are up to five and a half meters high to provide the necessary shade and the entire impression created is one of a desert, dry, stony and dusty. Everything is constructed from slightly reddish, in situ concrete. The character of the complex is chiefly defined by the surrounding walls, which create the impression of petals that close and open towards the sky. The dwelling itself is invisible and develops across a single floor behind the surrounding walls. The living room is located at the end of a strict axis leading from north to south. It overlooks the pool and offers a view through the southern door in the garden wall across a flat and empty landscape. A curved hallway allows the inhabitants to retreat into shadows and into the introverted private rooms. Swiss architect Valerio Olgiati added concrete fins to the walls of this house in rural Portugal, which splay outwards and inwards like the flaps of an open box to provide shade for a garden within (+ slideshow). The 5.5-metre-high walls were constructed from a red cast-in-situ concrete designed to harmonise with the colour of the rusty earth and to conceal the single-storey dwelling within, making it invisible from outside the compound. "The character of the complex is chiefly defined by the surrounding walls, which create the impression of petals that close and open towards the sky," explained Olgiati. "The primary intention here is to create a secluded garden," he added. "The surrounding walls are up to five and a half metres high to provide the necessary shade and the entire impression created is one of a desert, dry, stony and dusty." 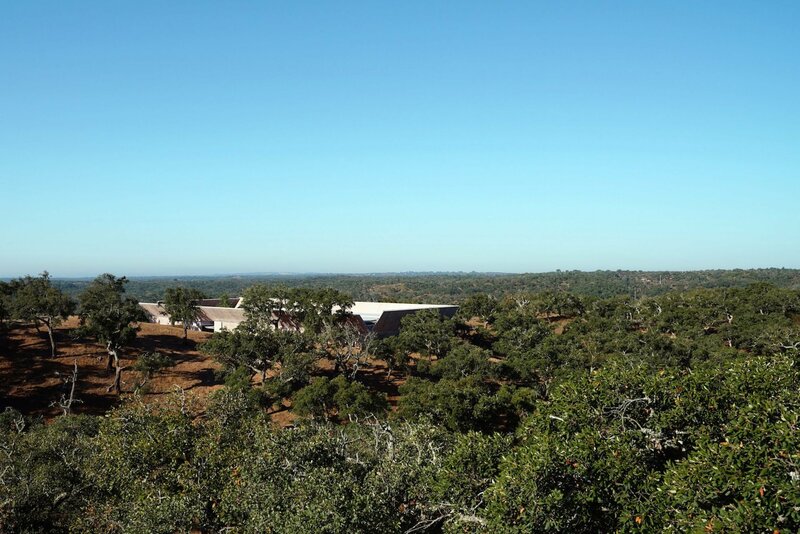 Named Villa Além, the property and its walled garden are located in the middle of a cork forest in Alentejo. The rural region in central Portugal is located approximately five miles inland from the Atlantic Ocean and is renowned for its vineyards, as well as the cork forests used to supply bottle stops for their produce. The gardens can be seen through wide openings in the outer walls and are protected from the area's free-roaming livestock by large metal doors. Two long beds positioned along either side of the courtyard are planted with succulents and small shrubs, while a cast-concrete trench with a marble base in the centre forms a swimming pool. At the opposite end of the courtyard, an outdoor dining area is arranged under a concrete awning that projects upwards and outwards from the facade of the house. Inside, tall raw concrete walls give the rooms and hallways a cave-like appearance that contrasts the sun-exposed courtyard. Small cork accents in the form of furnishings refer back to the landscape. A long arch-shaped corridor runs along the living spaces at the front of the house before hooking around to three bedrooms and bathrooms arranged in a row behind. "A curved hallway allows the inhabitants to retreat into shadows and into the introverted private rooms," said the architect. Each of the three bedrooms has access to its own private patio set along the periphery wall, and all three are covered with flat concrete roofs that feature elongated oval openings. The dining room occupies a gabled structure at one end of the north-south living strip, while a living room is located in the centre. From this space, residents can look out over the courtyard pool and on through a gateway in the southern wall of the garden to the woodland beyond. 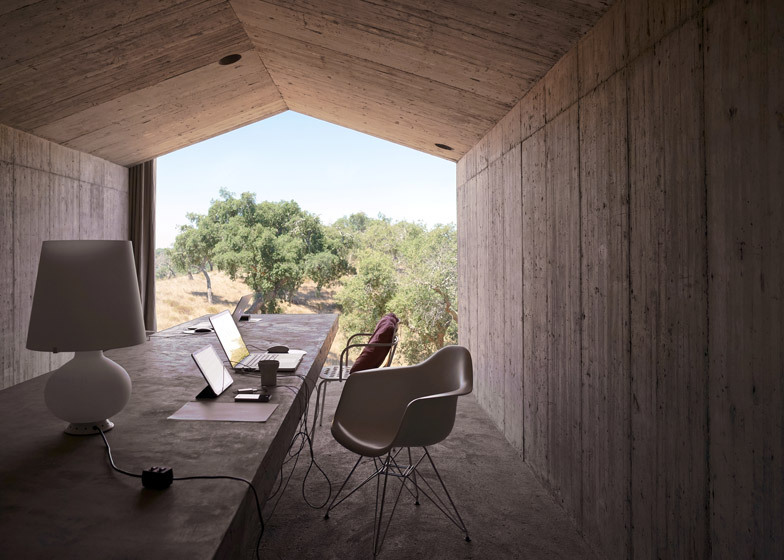 Located in Alentejo, a rural region in central Portugal, Villa Além by Swiss architect Valerio Olgiati is characterized by concrete walls which splay outwards and inwards like the flaps of an open box to provide shade for a garden within. 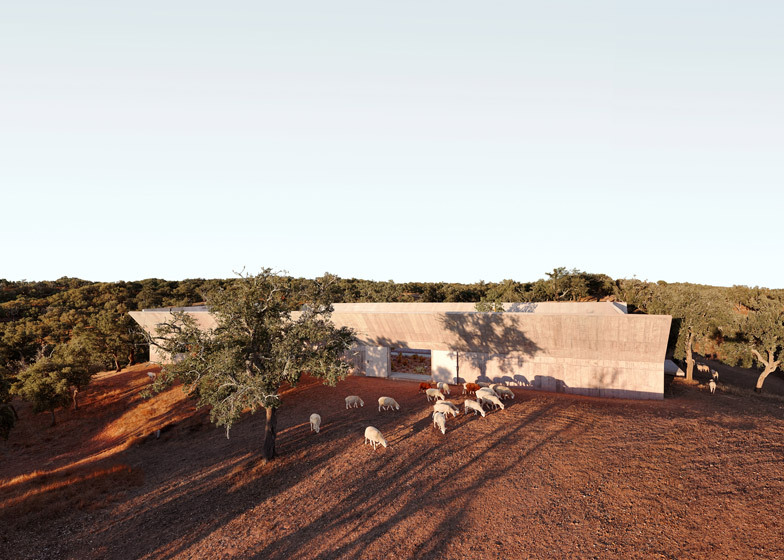 Nestled within an extensive forest of Cork trees in rural region of Alentejo in Portugal, is the sheltered Villa Além by world renowned Swiss architect, Valerio Olgiati. 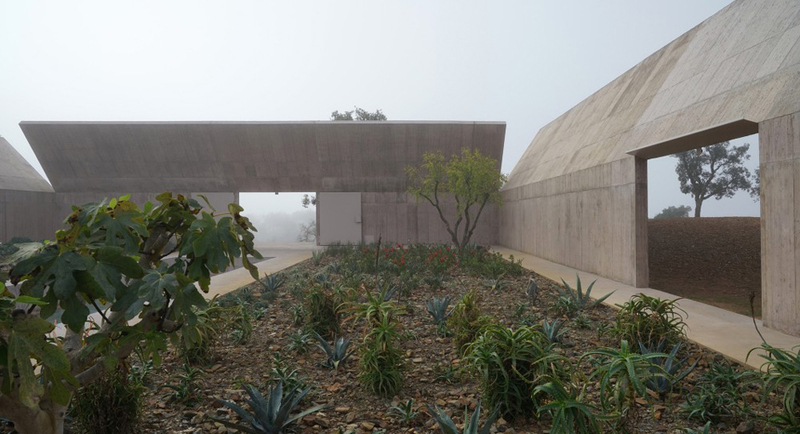 Offering a unique reinterpretation on the idea of courtyard, within the context of a family home, the design of the Villa Além is primarily characterized by its striking reinforced concrete walls that define the internal courtyard, offering a secluded and private space. 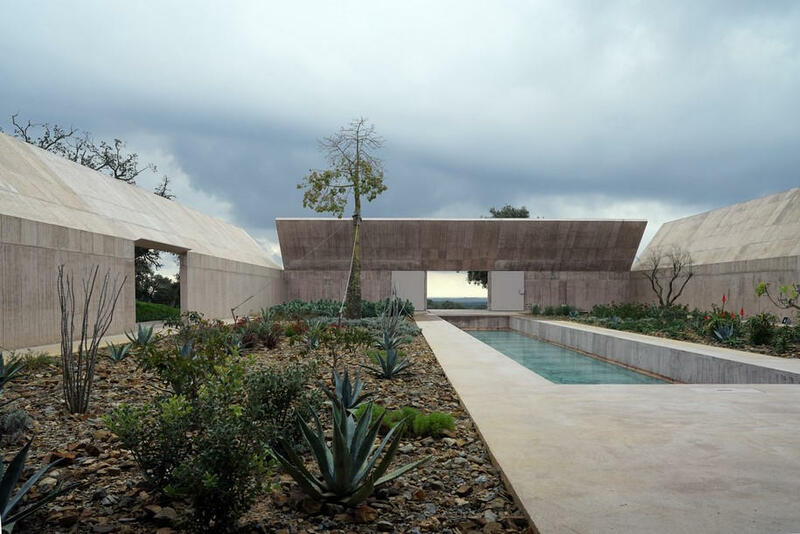 Furthermore, the outer concrete partitions of the Villa Além branch out and fold creating almost like the lids of a box, creating shaded spaces with framed open views of the sky. The house layout is invisibly disbursed within these reinforced concrete walls and faces the internal courtyard, receiving ample lighting. The living room space of the Villa Além faces the internal courtyard and opens up onto a spacious patio and an external swimming pool. Adjacent to this and separated by concrete wall, is the dining room space that also spans out towards the exterior through a glass wall. Following this, on the other side of the Villa Além is the kitchen space which is contained within a semi-circular room that is framed in concentric circles by the hallway that allows easy access to all bedrooms, in the form of a loop. The bedrooms are laid out linearly, each equipped with their individual and private courtyard spaces. 10 kilometers off the atlantic coast in the alentejo region of portugal, the villa alem by swiss architect valerio olgiati sits amongst a vast forest of cork trees common to the area. the home is rather simple, if not very unique- it is characterized primarily by the reinforced concrete walls that define an inner courtyard, open yet entirely private. these outer partitions, once reaching a certain height, fold either into the space or away from it almost like the lids of a box in order to create shade or open views to the sky. the one-story house is nestled invisibly within these walls and faces the courtyard to receive plenty of daylight. the living room faces the courtyard, opening up onto an exterior patio and central pool. adjacent to it, separated by a structural wall, a dining room projects out towards the exterior through a full glass wall. on the other side, the kitchen sits within a semi-circular room outlined in a concentric circle by a small hallway that loops around to the bedrooms along the backside. each bedroom, arranged in a lineal fashion, contains its own private courtyard.